My silver nature jewellery is an ethical gift that gives back. It all supports my work raising awareness of how we can stop the sharp decline of our wild hedgehogs. My customers receive something beautiful for themselves or a loved one and our favourite garden visitors are helped in the process. My jewellery is inspired by nature and wildlife, including the plants and flowers in my own wildlife garden. I work hard to carry these values throughout the business; from the materials I use to make the jewellery, to the boxes I package it in. Where possible, everything is recycled and recyclable. I use silver clay to create my designs. It’s an amazing product that allows nature to literally be imprinted upon silver. Leaves, flower heads, plant stems, shells, can all be pressed into the clay, which is then fired to solid silver. Best of all, it’s environmentally friendly and made from recycled silver. 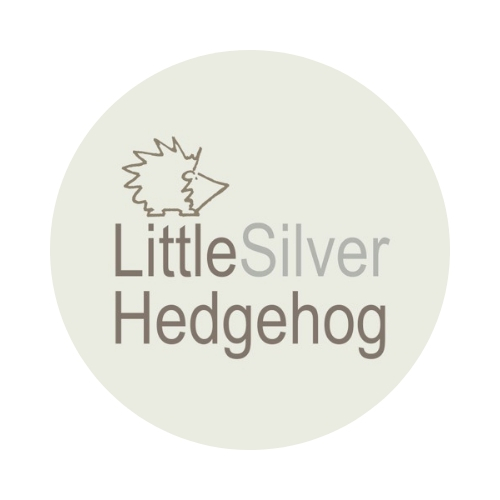 Each piece of jewellery is lovingly packaged in a Little Silver Hedgehog gift box – ready to give as a gift or to keep for yourself if you can’t bear to part with it. I use these gorgeous boxes from the Tiny Box Company. The card is made from consumer waste and the paper outer from sustainable sources. The boxes I use for sending orders through the post are also made of recycled card, which can itself be recycled and I seal them with gummed brown paper tape, not plastic. My jewellery also helps raise awareness of the plight of our wild hedgehogs – whose numbers have declined dramatically in recent decades. There are now thought to be less than one million left in the wild with humans being the number one threat to their survival. Each order is sent with a postcard of a rescued hedgehog and a leaflet about how to help our wild hedgehogs. I hope that all my customers will be inspired to do their bit and pass the information on to family or friends, multiplying the impact and the numbers I can reach with this vital message. I hope that people buying or receiving my nature jewellery can take heart in the fact that their purchase helps a hedgehog and doesn’t hurt the planet in the process – it really is a gift that gives back.